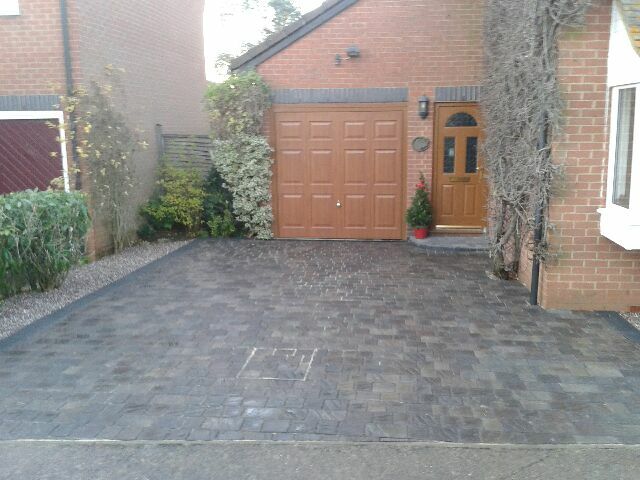 Our clients in Wellingborough wanted their driveway replaced, a channel drainage system at the front of the garage , the removal of some of the old shrubs and bushes from the front and side of the property and a new design for the front garden. The pictures below were taken of the different areas before we started work. The first job was to remove all the the old 900mm x 600mm paving slabs. then we removed some of the old shrubs and bushes from the front and side of the property. Once the area was cleared we were able to prepare the ground,ensuring it was all level. The areas were marked out and then we were able to begin with the laying of the slate coloured Tegla blocks, ensuring access was left to the drain which was in the driveway. The blocks were also used to outline the shape of the design for the front garden. This would be complemented with decotative stone; with the bed being planted with shrubs etc once the customer has selected what plants they want. The channel drainage system was installed in front of the garage door with a soak-away to the left hand side. A small step was created at the front door and the shrubs which were left in were pruned and the border dressed with decorative stone. With everything now complete, apart from the planting which we will return to do once our customer has decided on plants. We all agree is looking pretty amazing, all the customers requests have been fulfilled. We will return to complete the planting and I will post pictures when this is done. This project has taken two people one week to complete. Hey! I have read all your Blog this is so nice and awesome service you have provided, I have learned so many new things from here and want to implement on my website. If you also want to know something new related to our services then visit my website. Hey! I have read all your Blog this is so nice and awesome service you have provided, I have learned so many new things from here. If you also want to know something new related to our services then visit my website. Fantastic clean, practical design.Enough greenery to keep it looking like a garden but very easy to maintain. Thumbs up on this one. What a transformation, it looks amazing! great design.